If, at this time last month, you had offered most anyone associated with the US national team – fans, coaches, players, pundits – four points through two games, I think everyone takes it. The US should have won. But that late dagger made it 2-2, and now "Result against the Germans" is a thing everybody has to think about. I was super-duper against the 4-5-1 lineup that the US trotted out from the start, and said as much in my pregame article. Obviously I was super-duper wrong. 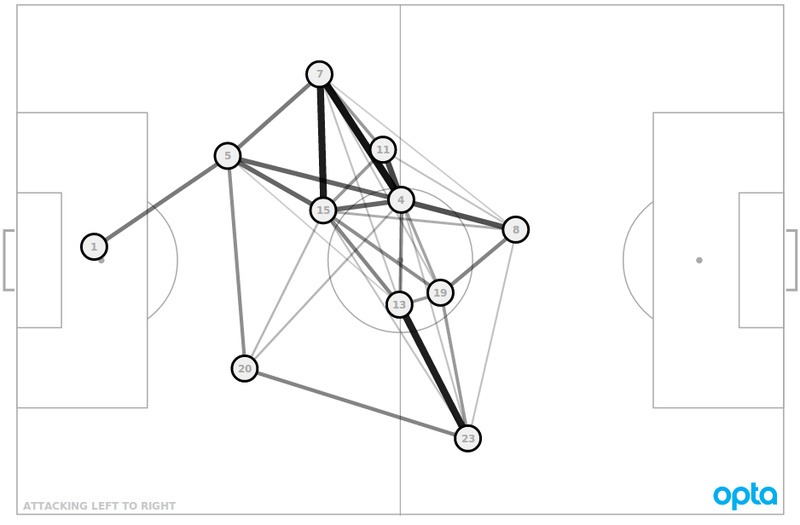 The US were somewhere between "very good" and "excellent" on the night, using the ball to open up the slow and static Portuguese, carving out chances without worrying about playing through a target forward, and recovering with both speed and purpose in transition. I thought the early goal was the death knell because it meant the US would have to come out of their shell and play, opening up the game for Portuguese speed on the flanks. Instead, it opened up the game for the Americans to string together passes and rip their opponents apart. The Portuguese central defense spent their game aruging with each other over positional mistakes when they weren't diving in for emergency defensive clearances. Dragging Clint Dempsey off the front line, keeping Graham Zusi wide and allowing Jermaine Jones to play a free role (which is really all he's ever wanted) was a brilliant decision from Klinsmann, and one I thought would not work. The US may have not been symmetrical, but they were incredibly balaned. Dempsey never got stranded on an island as the lone striker (and he did play as a striker – this was a 4-5-1, not a 4-6-0) and whenever the defense had to rotate over to cover, the spacing was good and movements were quick. And from an attacking perspective, even the subs wree good. Everything was working. Until it wasn't. Geoff Cameron is going to take a beating for his early flub and late bout of ball-watching. Michael Bradley is going to take his share of grief for his late giveaway. Fabian Johnson's late reactions on defense – and apparent failure to communicate with Cameron on the second goal – is also a persistent problem. 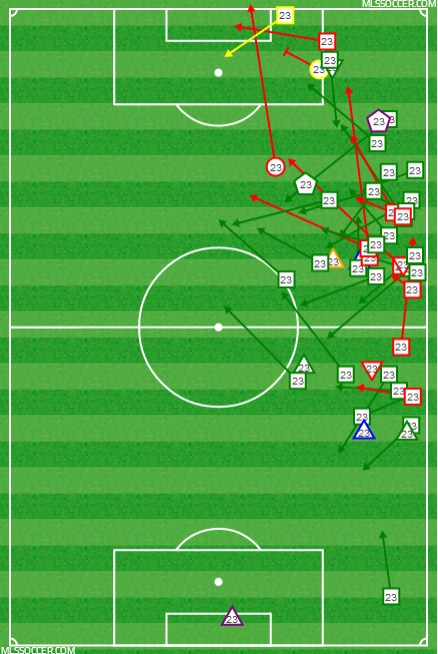 Rough, taxing night for a couple guys, but especially Geoff Cameron. Was very solid aside from two moments. Two tournament-hinging moments. No matter how tight the tactics are, no matter how right the coach is, it's the players who have to make the plays. And the current USMNT has a horrible, worrying habit of saving its worst moments for late in the game. In their last four games – two friendlies and now the two group stage games – the US have conceded four goals after the 80th minute. Those crucial moments, when both teams are flagging and somebody needs to have the extra three percent that wins you points? Save for set pieces (thank god we're still dominant there), this group doesn't appear to have the legs to stay in them. They are sloppy in possession down the stretch, and even worse in closing down running lanes. All the precision you saw from this team through the first 80 minutes disappeared over the final 10. What really defined the game tactically for the US was the way they made Cristiano Ronaldo into a giant, honking liability for all but the last 30 seconds. He simply refused to play any defense, do any tracking at all, which meant that Johnson was free to push forward and create 2-v-1s all day up the right side. And then when Ronaldo switched to the other side, it was DaMarcus Beasley's turn to do the same. This is more excellent, brave game-planning from Klinsmann. I've been critical of him often for trotting out overly defensive lineups, and using regressive game plans designed to destroy the game rather than control it. And maybe in this one, if the US hadn't gone down a goal early, that's what we would have seen. But I don't care about what "might have" happened. I care about what did happen, and in this case it was a coaching staff identifying and exploiting an opponent's weakness. Klinsmann did a great job, as did Johnson. They both deserved a happier ending. Sorry folks, from @ESPNStatsInfo . Ronaldo was 1-for-1 on crosses today. The entire USA squad was 0-for-14. This speaks to the continuing trend towards inversion in the modern game. It's often more profitable for fullbacks to get inside and combine instead of bombing down the touchline and whipping the ball in, especially when playing with only one target forward. That said, the US have to do a better job of hitting their targets when they do, in fact, choose to bend in a cross. Some of the best goals of the tournament have been scored that way, and even though the game has changed... I mean damn, we all saw Portugal's final goal, right? Get your wingers to the back post. 5. Tim Howard has to stay bigger. He wasn't really at fault on either the Andrew Ayew goal vs. Ghana or Nani's opener on Sunday night, but in both cases, he was down on the ground earlier than he needed to be. He looks like he's guessing. 4. Other than Jones, Matt Besler and Kyle Beckerman were the men of the match. They keep the US line so tight, and operate as a unit when in pursuit. Sporting KC will get an offer from somebody large for Besler at the end of this tournament. 3. Overall, the US are a more talented team than Portugal. Yes, they have Ronaldo, which on balance probably makes them favorites against the US seven times out of 10 if he's healthy. But it's well beyond time to understand that this US team can play with anyone even if they're not drawing paychecks from the very biggest clubs in the world. 2. Portugal have no prayer against Ghana. They'll be on one fewer day of rest, they are static, they can't keep up with athletic players out wide, and Ghana punish the hell out of turnovers. The Black Stars could actually run up the score on this one and lap the US on goal differential. 1. A draw between Germany and the US puts both teams through. I'm not saying they're going to play for the 0-0 draw, but would anyone be surprised? We saw it four years ago when Spain and Chile played – they knew a 2-1 Spanish win would put them both through to the knockout rounds. Guess what the final score was? The game can be cruel. But it can also be predictable. I believe that we will draw.